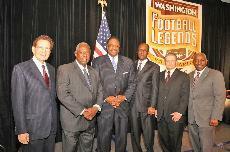 The Washington Football Legends for Charity benefiting the Shack Harris and Doug Williams Foundation headed by the two NFL quarterback greats honored four "legends" last month.Legendary Hall of Fame wide receiver Charley Taylor received the Bobby Mitchell Champion of the Gridiron Award; James "JB" Brown, Emmy Award-winning host of CBS Sports' NFL shows received the George Michael Excellence in Media Award; Coach Bill McGregor of the perennial champion DeMatha Catholic High School received the Champion of the Gridiron Award; and for his philanthropic work, malpractice lawyer Jack Olender received the Community MVP Award presented by Doug Williams. Baseball Hall of Fame inductee Hank Aaron gave the keynote address. Thomas Moorehead of the Sterling Automotive Group Foundation sponsored over 2 dozen scholarships. Channel 7's Maureen Bunyon was Mistress of Ceremonies.